Aim A controlled bench test was undertaken to determine the performance variability among a range of neonatal self-inflating bags (SIB) compliant with current International Standards Organisation (ISO). Introduction Use of SIB to provide positive pressure ventilation during newborn resuscitation is a common emergency procedure. The United Nations programmes advocate increasing availability of SIB in low-income and middle-income nations and recommend devices compliant with ISO. No systematic study has evaluated variance in different models of neonatal SIB. Methods 20 models of SIB were incrementally compressed by an automated robotic device simulating the geometry and force of a human hand across a range of precise distances in a newborn lung model. Significance was calculated using analysis of variance repeated measures to determine the relationship between distance of SIB compression and delivered ventilation. A pass/fail was derived from a composite score comprising: minimum tidal volume; coefficient of variation (across all compression distances); peak pressures generated and functional compression distance. Results Ten out of the 20 models of SIB failed our testing methodology. Two models could not provide safe minimum tidal volumes (2.5–5 mL); six models exceeded safety inflation pressure limit >45 cm H2O, representing 6% of their inflations; five models had excessive coefficient of variation (>30% averaged across compression distances) and three models did not deliver inflation volumes >2.5 mL until approximately 50% of maximum bag compression distance was reached. The study also found significant intrabatch variability and forward leakage. Conclusion Compliance of SIBs with ISO standards may not guarantee acceptable or safe performance to resuscitate newborn infants. Self-inflating bags (SIBs) are the most common device used to provide positive pressure ventilation during resuscitation at birth. The United Nations programmes are advising increasing availability of SIB in resource-poor nations. International standards guide clinicians, regulators and manufacturers as to safety and performance of SIB. Some SIBs brands do not deliver safe reproducible ventilation suitable for use during newborn resuscitation. Non-delivery of volume at any compression distance as a consequence of poor SIB patient valve design and batch variability is undetectable by the operator. Stated compliance to International Standards Organisation does not guarantee safety and efficacy of delivered ventilation when using SIB. In 2012, the United Nations (UN) Commission on Life-Saving Commodities for Women and Children identified the need to increase access to neonatal resuscitation devices in 50 of the world’s poorest countries.4 The provision of SIBs to birth attendants for all newborns requiring resuscitation in the low-income and middle-income countries has been a recent major world health initiative.5 6 These initiatives have identified the need for a significant boost in the production of SIBs in order to meet the global demand for the device. In addition to the production of SIBs, training, education, device maintenance and distribution are crucial elements in this health initiative. Manufacturers of SIBs are guided by international standards as to the ventilation performance required to provide effective ventilation at birth. The current International Standard Organisation (ISO) document for manual resuscitators ISO 10651.4-2002 (reviewed 2013), advises that SIB ventilation performance (section 6.7), for ≤5 kg body weight should be able to deliver a minimum 20 mL volume into a test lung (compliance 1 mL/cm H2O, resistance 400 cm H2O/L/s), at I:E ratio 1:1, 60 inflations per minute and provide a safety pressure relief at 45 cm H2O. 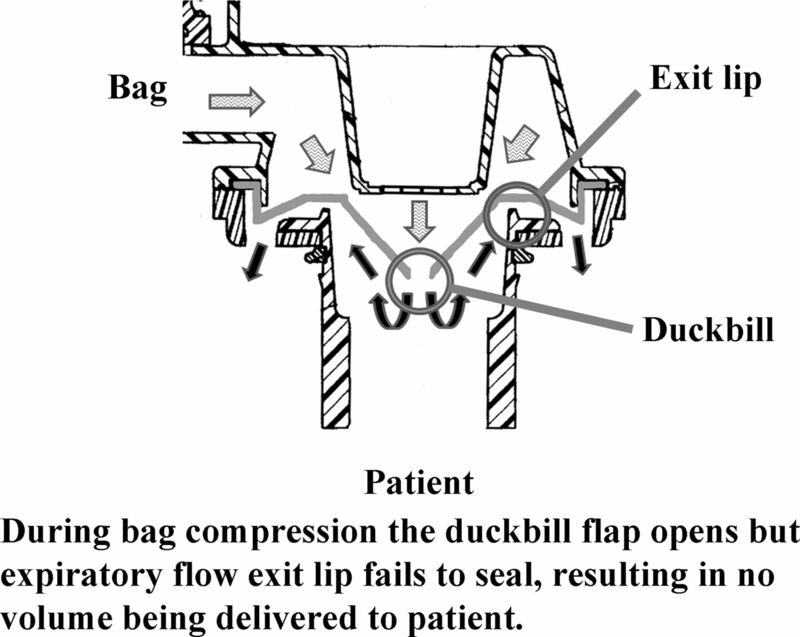 It also warns that delivered volume may bypass the patient when bag is compressed. This is termed forward leakage of the patient control valve (PCV). A poor response to initial resuscitation with SIB compression should prompt the resuscitator to first adjust the way the mask is held in position on the face to avoid or eliminate potential mask leak, reposition airway and assess the airway for obstruction. Only then should bag compression be increased to generate higher pressures to increase the delivered ventilation.2 11 Too vigorous bag compression may cause lung injury (pneumothorax, chronic lung disease in the preterm) due to excessive pressures and tidal volumes (VT), overventilation and hypocarbia.12–15 There is a general assumption that when using SIBs there is a consistent relationship between distance compressed and delivered VT for any given lung compliance. A computer-controlled two-armed robotic mechanism simulating ‘standard hand compressions’ provided incremental compressions to SIBs across a precise range of distances. The relationship between distance of bag compression, delivered VT and airway pressure were examined. Twenty different models of SIB (n=173) resuscitators were examined with an average of nine units per model summarised in online supplementary table S1. Some manufacturers produced multiple SIB models with differing part numbers and physical characteristics. A test lung (Drager Lubeck, Germany) of known compliance (0.5 mL/cm H2O) and resistance (50 cm H2O/L/s) was attached to the SIBs with a respiratory function monitor (RFM) (Acutronics, Medical Systems, Zug, Switzerland). All SIB units were functionally checked according to each manufacturer’s insert instructions, and tested for compliance to ventilation performance as specified in the current ISO standard20 before our testing model was applied, all devices complied. The robotic mechanism was programmed to mimic forces generated by a human hand compressing an SIB at an inspiratory time of 0.5 s, I:E ratio 1:1 and an inflation rate of 60 per minute (IPM) as recommended in the ISO standard at all distances tested (see online supplementary data: SP5.pdf). The programme sequence was designed to provide 40 compressions at each defined distance starting at 15 mm at a rate of 60 IPM. The robotic mechanism automatically increased compression distance in increments of 5 mm (±0.03 mm) after the previous run of 40 inflations. This sequence continued to a maximum distance of 60 mm (which corresponded to approximately 82% of maximal bag compression distance averaged across the models (see online supplementary table S1). Overpressure valves were left in their normal operating position during testing. The RFM hot wire pneumotach and pressure sensor line were sited between the SIB under test and the test lung where the airway pressures and flows were measured. System was calibrated with an external syringe of known volume, and pressure/flow via a traceable reference ventilator analyser (PF300, IMT Medical, Buchs, Switzerland). Analogue signals output from the RFM were collected and digitised at 200 Hz with data acquisition and analysis software (Spectra, Grove Medical, London UK). The pneumotach was re-zeroed before each SIB was tested. Our primary outcome was a ‘pass’ or ‘fail’ assessed as passing all four criteria determined a priori: safe minimum average VT for the smallest expected newborn infant between 5 and 10 mL/kg21 (2.5–5 mL); <30% average coefficient of variation (CV) in volume delivered over compression distance per device and SIB model; 99% of delivered peak inflation pressures (PIPs) are <45 cm H2O as recommended by the ISO standards and a functional compression distance where the device starts delivering average tidal inflations ≥2.5 mL before 50% (≤30 mm) of total bag compression is reached. Analysis was conducted using Stata (V.13 MP, StataCorp, College Station, Texas, USA). The measured parameters included the mean, %CV, maximum PIP and VT. Analysis of variance (ANOVA) for repeated measures was used to determine differences between models and units for VT delivered at each distance. ANOVA were reported with p values adjusted F test using Box’s conservative epsilon, p values of <0.05 were considered to be statistically significant. A total of 67 540 compressions from 20 different models (173 individual SIB units) provided 48 493 compressions with volumes ≥2.5 mL, and 2191 compressions with volumes <2.5 mL. There were 16 856 compressions where the SIB failed to deliver a measurable volume when compressed. Based on the a priori ‘composite pass’ criteria, 10 of 20 models passed on all four predetermined characteristics (table 1). Of those models passing all criteria, 30 963 (81.6 %) compressions provided VT≥2.5 mL. This was compared with 17 530 (59.2%) compressions of models failing one or more criteria. Variations in delivered PIPs are detailed in online supplementary figure S1. Meditrin and Hudson SIBs could not provide the minimum safe volumes for a 500 g infant. Of note, start volumes for these models were at >50% total compression distance (table 1 and online supplementary table S1). 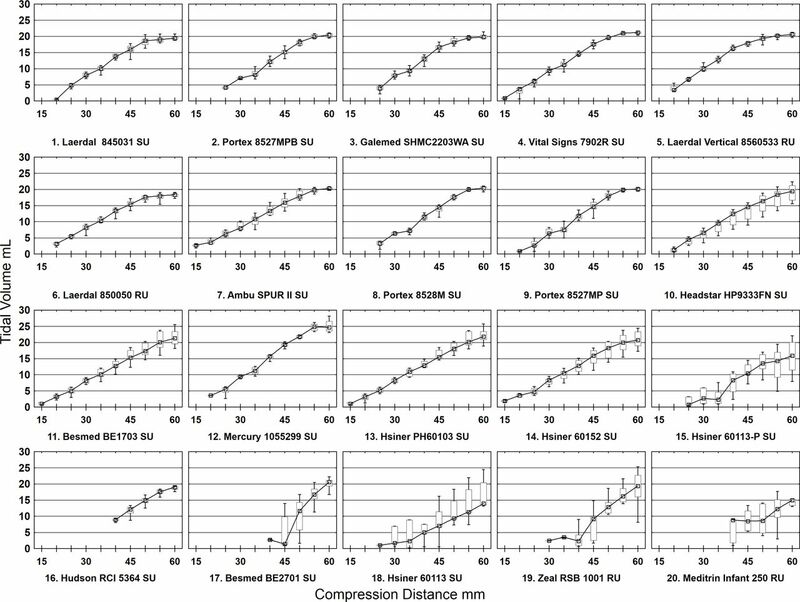 Detailed results of VT per compression distance per SIB model batch are presented in online supplementary table S2. Figure 1 shows box and whisker plots of delivered VT per SIB model batch at each compression distance. Box and whisker plots of delivered tidal volumes per self-inflating bags model batch at each compression distance with Lowess regression lines. RU, reusable; SU, single use. Five models had average %CV exceeding 30% ranging from 34% to 46.7%. The overall mean VTs were 2.0 mL lower for those models with %CV>30% than not (95% CI −2.2 to −1.9 mL) (table 1 and Supplementary data table S2. Eight hundred twenty-one inflations exceeded the safety limit of 45 cm H2O (mean 48, range 45.1–53.0 cm H2O) in six models (table 1). This represented approximately 6% of all inflations of these models. Six models were found to be unsatisfactory by exceeding the peak inflation safety limit criteria (figure 2). Box and whisker plot inflations >45 cm H2O for high peak inflation pressure (PIP) fail models. RU, reusable; SU, single use. 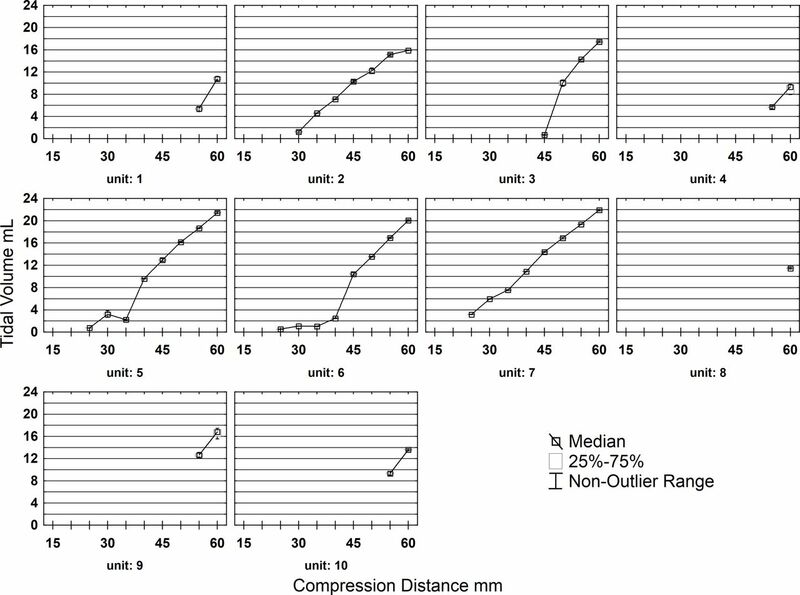 Three models did not deliver measurable inflation volumes until 40 mm compression distance corresponding to approximately 67% of maximum bag compression (table 1). These three models also failed on at least two a priori criteria. The Meditrin exhibited a variance in starting distance from 40 to 55 mm and one unit was unable to deliver measurable volume at any compression distance. 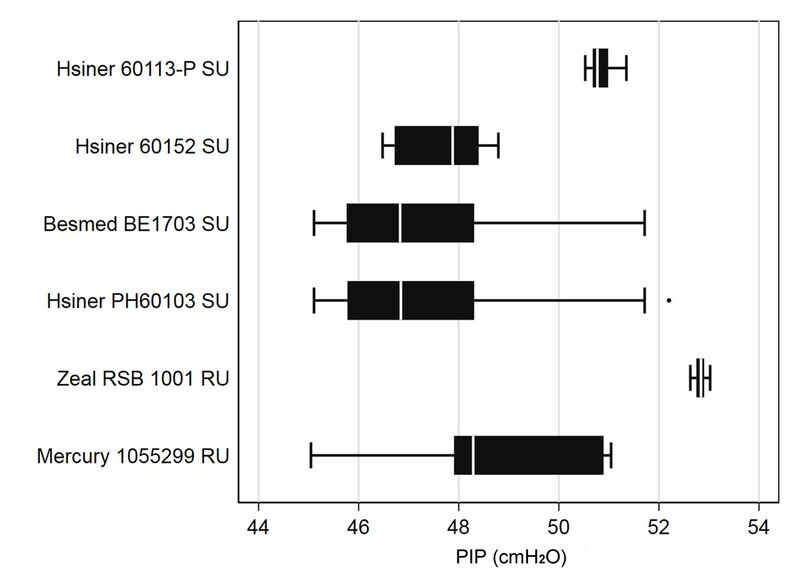 The Hsiner 60 113P SIB was notable in that 5 of 10 units did not deliver a minimum usable volume until the 55 mm starting distance was reached in contrast with the 3 units that started at 25 mm compression distance (figure 3). Poor batch variance self-inflating bags (SIB) Hsiner (part no60113 P). Box and whisker plots of delivered tidal volumes per SIB unit at each compression distance with Lowess regression lines. Limitations of this study are the use of a low compliance test lung model of ill newborn infants. Many of the SIB models tested are rated for use up to 10 kg body weight, which reflects infant/paediatric use (see online supplementary table S1).23 The performance issues found in this study are similar to those found by Kain et al in a paediatric SIB bench study using higher test lung compliance (10 mL/cm H2O).24 A potential limitation is the generalisability of the two-armed robotic mechanism compared with a human 2–5 fingered hand compression. However, Basinni et al have shown no difference in delivered volume between 2/3/4 and 5 finger hand compressions.25 The inflation time would be <0.5 s of compression time when forward leakage was present. Our results indicate compliance to the ISO standard by SIB manufacturers may not guarantee the efficacy of the device to deliver a safe or uniform volume of gas when the SIB is compressed. Non-delivery of volume to the patient connection when the SIB is compressed is termed forward leakage in the ISO standard.20 Forward leakage cannot be routinely detected by the operator during resuscitation (figure 4 and online supplementary video1.mpg). Cross-section of self-inflating bags patient control valve illustrating forward leakage. (Original artwork US Patent 5722394A, modified and illustrated by M Hinder). The current ISO standard warns: ’If forward leakage is a design feature of a resuscitator, this should be disclosed so that the user does not confuse this leakage with a malfunction’ (page 20 Rationale B.6.5).20 Notwithstanding, we found no testing methodology to detect or quantify forward leakage described in the standard, and there was no disclosure in any of the product literature supplied with the devices examined in this study. Forward leakage does not appear to have any beneficial characteristics that we can determine. Resende et al in 2006 examined 10 experienced neonatologists ventilating intubated preterm lambs with SIB (Hudson Lifesaver) showing great variation in delivered PIP and excess VT/kg (median 17.8 mL/kg IQR 14.1–22.4).28 Resende et al concluded their results are explained by operator variation. Our results of the same model of Hudson Lifesaver SIB alternatively suggest forward leakage of PCV as a major potential contributing factor. The ability of some of the SIB models tested to safely deliver ventilation to a low compliant newborn lung (term apnoeic or preterm <1 kg) is questionable. As all units in this study passed the ventilation performance testing detailed in the current ISO standard (section 6.7<5 kg),20 the results suggest the standard may be inadequate to detect models of SIB that have manufacturing issues causing serious deficiencies in biomechanical performance. The estimated number of SIBs required for implementation of UN programmes in eight identified low-resource countries is approximately 400 000 units alone.29 30 Most of these countries are without an established regulatory authority to oversee the quality and safety of medical devices. The likelihood of the distribution of inferior devices with poor performance and unacceptable intrabatch variation is great. A major concern arising from this study is that significant forward leakage via the PCV can lead to a complete lack of VT reaching the patient. The operator being unaware of this issue would likely react to poor clinical response by increasing the compression distance. At some point, the PCV closes resulting in delivery of a potentially excessive, harmful VT to the patient. Half the SIBs examined in this study failing our testing method exhibited unacceptable performance variation between units despite all models passing current ISO standard criteria for delivered ventilation <5 kg. We conclude that the current ISO standard 10 651.4–2002 (reviewed 2013) for life-saving manual inflation devices specific to SIBs may need substantial revision. SIBs that were shown in this robotic simulation study to fail our testing methodology may potentially be unsafe for use with vulnerable newborn infants. The authors would like to thank the self-inflating bag suppliers for provision of devices to examine in this study. United Nations, 2012. Commission on life-saving commodities for women and children http://www.unfpa.org/publications/un-commission-life-saving-commodities-women-and-children (accessed 22 Mar 2018). American Academy of Pediatrics, 2016. Helping babies breathe http://www.helpingbabiesbreathe.org/ (accessed 22 Mar 2018). World Health Organisation. Guidlines on basic newborn resuscitation, 2012:1–66. http://www.who.int/maternal_child_adolescent/documents/basic_newborn_resuscitation/en/ (accessed 22 Mar 2018). PATH, 2016. Program for appropriate technology in health http://www.path.org (accessed 22 Mar 2018). Program for Appropriate Technology in Health (PATH), 2006. Global inventory of neonatal resuscitators http://www.path.org/publications/detail.php?i=1280 (accessed 22 Mar 2018). Program for Appropriate Technology in Health (PATH), 2010. Practical selection of neonatal resuscitators version 3, a field guide http://www.path.org/publications/detail.php?i=1565 (accessed 22 Mar 2018). World Health Organisation, 2016. WHO technical specifications of neonatal resuscitation devices. http://apps.who.int/medicinedocs/en/m/abstract/Js22389en/ (accessed 22 Mar 2018). American Academy of Pediatrics. Textbook of Neonatal Resuscitation (NRP). 7th edn, 2016.
. Bronchopulmonary dysplasia and lung rupture in hyaline membrane disease: influence of continuous distending pressure. Pediatrics 1975;55:51–4.
. Compliances of the liquid-filled lungs and chest wall during development in fetal sheep. J Dev Physiol 1991;16:105–13.
. Description of positive pressure ventilation and lung compliance in 1053 apneic neonates at birth. Poster session presented at:. Pediatric Academic Societies Meeting. Toronto Canada, 2018.
International Standards Organisation, 2004. ISO 10651.4-2002 lung ventilators for medical use part 4: particular requirements for operator-powered resuscitators (reviewed 2013). https://www.iso.org/standard/30712.html (accessed 22nd Mar 2018).
. Assisted ventilation of the neonate. 5th ed: W.B.Saunders, 2011.
. Limitations of self-inflating resuscitators. Pediatrics 1986;77:417–20.
. Critical incidents with nonrebreathing valves. Anaesth Intensive Care 1990;18:560–3. Program for Appropriate Technology in Health (PATH), 2014. Shaping the market of neonatal resuscitation equipment. http://www.path.org/publications/detail.php?i=2409 (accessed 22 Mar 2018). Program for Appropriate Technology in Health (PATH), 2014. Market sizing estimates for neonatal resuscitation equipment. http://www.path.org/publications/detail.php?i=2408 (accessed 22 Mar 2018). Contributors MBT conceptualised and designed the study, drafted initial manuscript, carried out statistical analysis of data, literature search and reviewed and revised manuscript. RH programmed software for robotic SIB compression device, data interpretation and reviewed and revised manuscript. ST assisted in writing manuscript, data interpretation and critically reviewed the manuscript. MKH assisted in study design and writing initial manuscript, design and construction of robotic SIB compression device, data collection, analysis and interpretation, reviewed and revised manuscript. All authors approved the final manuscript as submitted and agree to be accountable for all aspects of the work. Ethics approval This study was approved by the Western Sydney Local Health District Human Ethics and Scientific Committee.